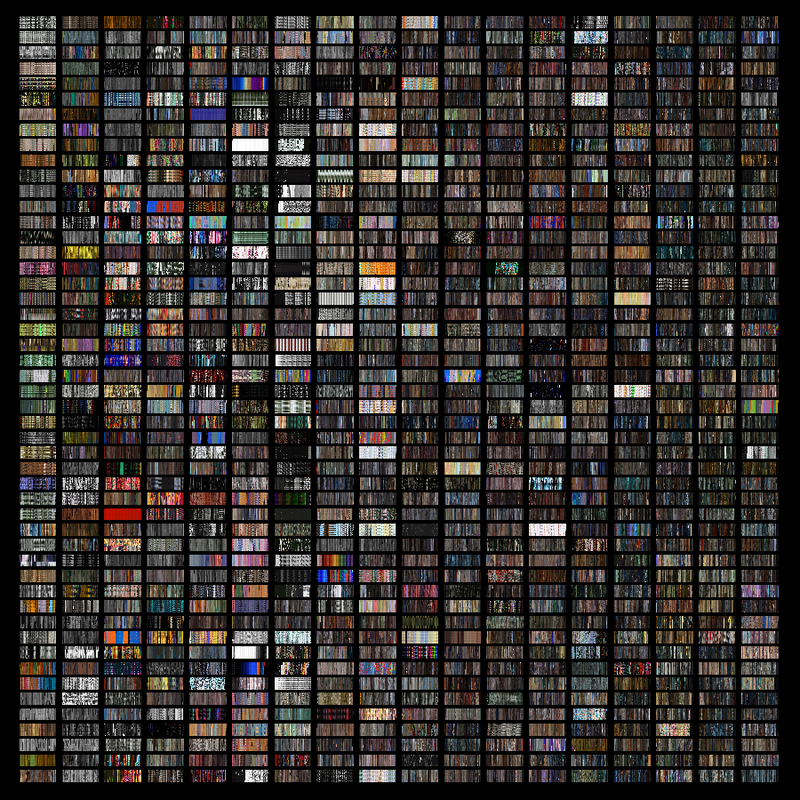 The cinematic fixations website is a visual database of film. Each fixation is created by arranging every frame of a film into a grid with a ratio of 3:1. No matter the length of a film the fixations are standardized so that films across genres and of varying durations can be compared and contrasted. The result is a color-banded timeline that reveals the underlying palette and the pattern of light variation of a film. Although divorced from plot, action, character, story, and sound, the fixations reveal visual clues of the filmmaker's use of color design in film. The name comes from a scientific term in microscopic biology. A fixation is a specimen whose motion has been arrested in preparation for scientific investigation. The standardized ratio of 3 to 1 mimics the dimension of the microscope slide, and allows for the simple division of the film into beginning, middle, and end. The database includes over 1200 film fixations, spanning the last 12 decades of cinematic history. The project invites students, academics, critics, artists, film buffs, and computer programmers, to work together to create a complete visual record of the history of film. The growing database is a repository for a rich visual history that is ripe for new analysis, and all are invited to participate. Through the generosity of the Meyer's Foundation Faculty Research Grant, the cinematic fixations website is searching for contributors. Anyone who is interested in writing a short essay (~500 words) about a film or films in the database, please send in richtext, docx, pages, or pdf format to jeffrey@jeffreymoser.com. Through a collaboration with West Virginia University, senior computer science students, visitors can now create fixations to add to the database. Email your request to download the program at jeffrey@jeffreymoser.com. The cinematic fixations project was inspired by the pioneering work of Dr. Robert Steele and his research assistant Robert Logan, who, in the mid-1960s, performed the very first scientific study of light rhythm in the cinema. Find out more on the history page. The cinematic fixations database currently houses 1200 film fixations. The website was begun in 2012, with a small spattering of films. On April 9, 2014 the database was 200 film fixations. On November 27, 2015 the database reached 800 film fixations. Working collaboratively, we hope contributors across the United States, and across the world will begin to submit films to achieve our goal of a complete visual database of film history.